Fresh vegetables are best known for their vitamin and mineral content, but these foods are more than nutritional powerhouses: They can also boost your weight-loss efforts by replacing higher-calorie fare and adding volume to your meals. With only 10 to 20 calories per half-cup serving, raw cucumbers and tomatoes add fiber, vitamin A and vitamin C to your daily menu. Incorporating these vegetables into a well-balanced diet -- which also includes other healthful foods -- can help you healthfully shed unwanted pounds. Substitute raw tomatoes and cucumbers for higher-calorie snacks like granola bars, cheese, crackers and chips. The low energy density of vegetables like tomatoes and cucumbers makes them more satiating than foods that pack more fat or carbohydrates per bite. By munching on these vegetables when a snack attack strikes, you'll feel full on fewer calories, helping you eat less throughout the day. Pairing them with lean proteins, such as grilled chicken breast or black beans, helps you feel even fuller after your meal. Add raw tomatoes and cucumbers to your meals as a side dish -- and eat them before chowing down on the rest of your food. Because of their high fiber and water content, these vegetables add low-calorie volume to your meals, filling you up quickly and making you less likely to overindulge on the main course. Eat raw tomatoes and cucumbers with a low-calorie dip or salad dressing. By pairing these vegetables with other flavors, you'll help add variety to your menu and stave off taste-bud boredom. Sprinkling cut-up tomatoes and cucumbers with herbs such as cilantro can also help you add flavorful, low-calorie variations to your daily diet. By opting for tasty vegetable dishes instead of higher-calorie items, you'll lower your energy intake for the day. Store a see-through container of sliced tomatoes and cucumbers in a visible place in your refrigerator. When hunger strikes, convenience often triumphs over diet convictions. You'll be more likely to pass over the high-calorie snacks and reach for the vegetables if they're already prepared and in an accessible spot. Reduce the amount of high-calorie fillings you use in sandwiches -- such as meat, cheese and mayonnaise -- and add extra slices of raw tomato and cucumber instead. This will lower the calorie content of your sandwich while also providing flavor, nutrition and a satisfying crunch. 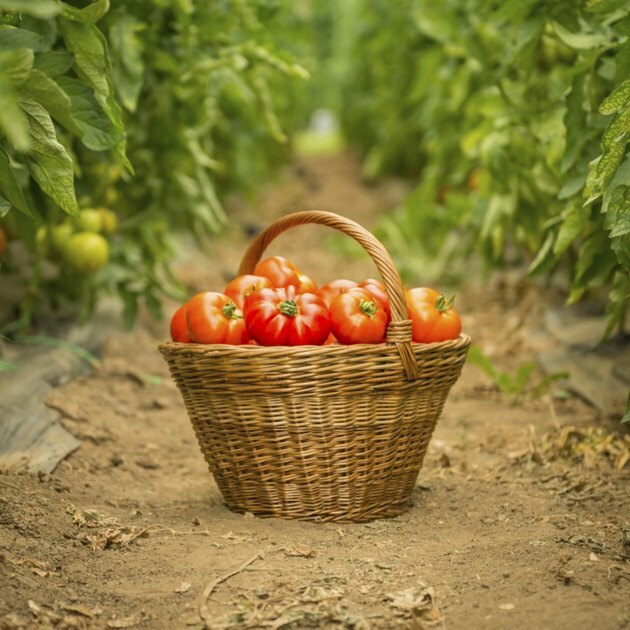 When selecting tomatoes to eat raw, look for ones that are completely red, firm and slightly aromatic; avoid tomatoes that are bruised or have green or yellow spots. The best-tasting cucumbers are generally rich green in color, have no soft spots and do not bulge in the center. Although these vegetable are naturally low in calories and fat, pairing them with high-fat dressings or other calorie-dense ingredients can negate their low-calorie benefits. Exercise and an overall balanced diet are important for reaching and maintaining your health goals. For the best weight-loss results, don't rely on vegetables alone to help you shed pounds. Always wash your tomatoes and cucumbers before consuming them. Raw vegetables can harbor pathogens that make you sick. Although raw tomatoes and cucumbers are high in certain vitamins, these foods are low in protein, essential fatty acids, calcium, iron and other important nutrients. Do not attempt to eat a diet containing only tomatoes and cucumbers. Can You Eat Raw Tomatillos?